Sorry that you singled us out as a threat to Boar welfare? That is very far from the case. We have good experience of Boar. My partner's comments on the audio-track were a nervous reaction to them coming so close. It was, I believe, unfair to embed our video, to illustrate your particular viewpoint about feeding them. We meant no harm. And this video has brought some delight to those unfamiliar with these wonderful Mammals. I rustled the bag to stop them coming closer. It is well known that Boar and domestic pigs are prone to potentially lethal results from extreme stress (ie. myocardial infarcts.) This would have possibly occured if they had come even closer, and suddenly realised we were right next to them. It would seem that perhaps you have made a strong, misguided judgement on our behalf? That is a shame. And a shame also that you should embed our video to highlight certain points about feeding Boar, and therefore misrepresenting us, and, especially, my partner in the process. As we all know, the internet is a public place. Defamatory comments can be viewed by all. But public reputations can also be damaged on both our parts. So, I publically ask you, nicely, please, either keep our video as a promotion for Boar in Britain, and ammend your prose in reference to it. Or remove it, and un-embed it. And no more will be said. Perhaps, an apology is also in order to my partner. She was very upset by your misrepresentation of her. And, in future? Please contact us if you wish to make such defamatory statements when using our footage. Dear Phil (? ), I'm sorry you and your partner have interpreted the piece this way as it was meant to be educational by showing others a typical encounter (this is the title of the piece). I too will answer you in public. I was personally delighted with your video as I'm sure many others will be. As you have confirmed, you became anxious with the closeness of the encounter and this is what I could tell. However, your explanation above is not what I expected! I wanted to show how an encounter usually goes in order to dispel fear. Getting an adrenaline buzz can be enjoyable. Some people, sadly,interpret adrenaline as a bad experience because they have been led to believe boar are dangerous. Your video shows otherwise. It is not a cherry picked video to use as propaganda, but what I see as a very nice video that shows how an encounter usually goes - and ends - with the boar running away. I can also sense your partner's apprehension in it. With the feeding, I only posed the question of "perhaps" you wanted to feed them because this is often a natural reaction with some people who care for animals. At 3:33 the girl says firmly "give them some food". I accept this was "possibly" meant to save the boars from having a heart attack, but again, this is "perhaps" a natural reaction for some people and I hope to educate that this also is not what anyone should do. I would like to take this opportunity to assure you that boar are not as delicate a creature as you may think. Maybe domestic pigs are (I've limited experience with domestic animals), but these are true wild boar and will not suffer at the sight of humans. I will change the wording soon, but I sincerely hope you see now that I love your video and your enthusiasm for the boar. Of course I do not think you were maliciously threatening to the boar because you wanted to feed them. Feeding does not in itself kill them but what people don't realise is their capacity to learn that humans hand out food and this soon gets them in front of a gun. Finally, I know only too well that "real people" are involved in the issue of wild boar. This is the MAIN premise for this blog. People are complex creatures and I want to use the internet to talk to "real people" in a way that educates as well as sometimes shows just how passionate many people are about the boar. Please accept my apology for the misunderstanding, and I hope you will be happy to let the blog keep your video. Our comments may also add something positive to the article if only to highlight just how complex the boar debate is, and how complex "real people" are! Dear Phil (? ), I forgot to ask you for your email so I may contact you in the future. Could you please email me (address is in Friends of the Boar - "About US" section), and I would obviously like to know if my reply is adequate. The boar in the forest are 400 years too late, Our lifestyles and homes have changed in the large period of time without boar. They cause considerable damage and are a high safety risk to road users, Yes, the right approach to a boar when coming across one will cause very little distress, but it's all of the other negatives associated with this wild animal that people are concerned about. You cannot compare them to any other animal like deer etc. we've always had deer in Great Britain. 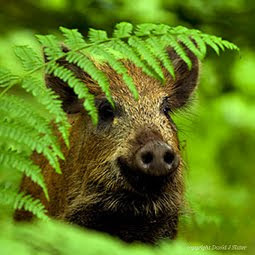 Wild boar do not have natural predators, and their population is now out of control, I know how these animals breed, and there are far more roaming the forest etc than estimated by any 'organisation'. Yes, at least 400 years too late, but the reason they have become so successful is because the forest is their natural environment. Yes, they can be a bit of a pain blocking my gate with turf and I have to modify walking with my dogs most days, always be alert, but I have come into contact with countless boar over past few years, and they they have not bothered me, sure they chased my dogs when they were untrained pups, (one of my border terriers was trampled when she was 16 weeks), but soon learned her lesson) but have no problems generally. Dog owners take note, keep your dogs under control and don't let off lead unless very well trained. The introduction of Lynx would be beneficial, as they will hunt hoglets, thus keeping population numbers manageable. Wild boar are destructive animals, Just drive through the Forest of Dean and take a look at the roadsides....in areas of France etc that are highly populated by boar, you will NOT see this kind of devastation...Too many in a small area.....And now I see there are Boar hunt Sabs...! These mindless idiots are obviously vegetarians from the town...What is happening to this country ? people need to be educated in these matters. Maybe these 'sabs' should be put in a pen with a sow and piglets, they'd soon change their minds... or maybe have a nice garden in the forest, or a crop field..? Very useful article! Here in Spain boars are quite common, and rural people usually say that they are very dangerous, and that a female with piglets (baby boars?) will attack you just because, even if you don't bother her piglets. They also say that a wounded boar will ALWAYS attack any human in sight. I thought that was pure nonsense, and judging from this blog, it seems like I was right! Boars are very widespread and common in Spain. They are a very typical creature in the Mediterranean ecosystems. Yet, I have never heard of a boar attack! So yeah, boars being bloody and dangerous towards humans seems to be just a superstition and an urban legend... or a rural legend, I guess. Sadly, most of the information I found in Spanish on the Internet were unfunded repetitions of that lie, so I decided to search about this topic in English... and here I am! I guess you Brits can judge this animal more objectively, as it isn't as common in the UK and therefore its image is not as distorted. I am glad to find this blog, as very recently I was in a French forest, climbing up through the trees over rocky terrain, and had just gazed over a valley. I turned back and suddenly saw a massive boar, with long thin white tusks pointing along its muzzle. It had come along the narrow path and looked surprised (as was I). I admired it but immediately I felt anxious, as though I was trespassing (I really thought it might charge at me). I quickly began climbing back up the steep rocky slope into the forest. My heart was thumping wildly and I didn't stop feeling afraid until I left the forest. It was in the Haute Loire. I judged "my" boar to be the size of a small cow (but my friend says this is ridiculous!) I wish I had a photo to prove its size and appearance as most of the ones online look scruffy and grotesquely ugly. This one looked in excellent condition! I have a steep, terraced olive grove which is being devastated by wild boar. It is a lot of work to rebuild my terraces only to be torn down again. Only last night I chased off a family of boar 10m from the house. Do you know of any natural repellents? For example I heard some people use chilli to deter elephants. Do you know anything that could help me? 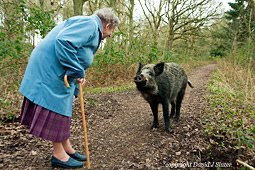 Sorry for the late response Nikki, we ahve been busy trying to shoo a boar off that keeps visiting a garden here in the Forest of Dean! In this instance, a more secure fence was the answer and removal of apples from a neighbours garden. Time is usually the only answer. Boar seem to quickly get use to anything you put down to deter them. Washing-up liquid soaked into the grass sometimes works - but may affect the worms in the grass that the boar are after! Those ultrasonic cat repellents have also been known to work, but again we think the boar soon learn to ignore. The best deterrent of all is a good strong fence. A dog, also, would work. You wrote a month ago and we would be interested to hear how ling the boar stayed on your terraces. Where the terraces growing fruit of any sort? Fruit or anything fermenting will always be a big draw for boar. I live in the Alpujarras in Spain. I encounterd a wild female boar on a very steep narrow path while walking my dog, and cat. I spotted it about 15 feet away in the bushes. I started to walk back up the path, she turned and started to run towards me. I could not run as it was too steep, it got about 6 feet close, I panicked and pushed a large stone down the slope towards it and yelled and waved my arms about. My legs went to 'jelly' and I did not stop shaking for a few days! I have dreams about the encounter and I am now too afraid to walk my dog down the mountain now. There were hunters that day, and locals say it is unusual to see a boar so close, and they will run away. The female was on her own, no babies. Will I ever get over my fear? hi are there any sounds that would scare a wild boar? If they are messing with crops could I trigger a sound using motion sensors to scare them away? The sound of a twelve guage firing works well...but after a while they get used to it. Then you have to really shoot them and things get really ugly because, well, pighide is tough. So no there really isn't.... except maybe a 50cent album at full blast. Thank you for this. I live in a rural area, and very recently, 3 boar have escaped from a local farm. They are all large, fully grown adults. My friend who has a lurcher says they are as tall as the dog, so big. I haven't seen them. I was today out walking at dusk, when I realised that they were within about 20 metres of me. I couldn't see them as it was too dark in the woods, but I could hear them roaring and bellowing and tearing up the ground... my god when you are alone in a dark wood at night and can't see the animals that is a terrifying sound! I like what you say about remembering where your fear comes from. I knew a man who had half his hand bitten off by a domestic pig he had reared from birth when he suprised it. I also knew of a farmer who had mental health problems and didnt feed his pigs for several days, and then when he did, was met by many caged, hungry animals... not pretty! So I was terrified. I feel much, much better having read this article. We live on the only local farm that doesnt allow any hunting, and we wanted to give these boar their fair chance at freedom... However, I was so scared at that moment I wanted them gone. I feel safe going out at night now... though I will remain cautious till I've met them in daylight!!!! It is interesting... I am a specialist in European fairy tales and mythology... so much stuff about not wandering from the pathway... dark woods, night time, alone, a roaring, bellowing animal you can't see... the fear is in our evolution. From what I have seen, boars are far from what you have described, they are intimidating, brutish and destructive creatures. You are well meaning dimwits but dimwits nevertheless! 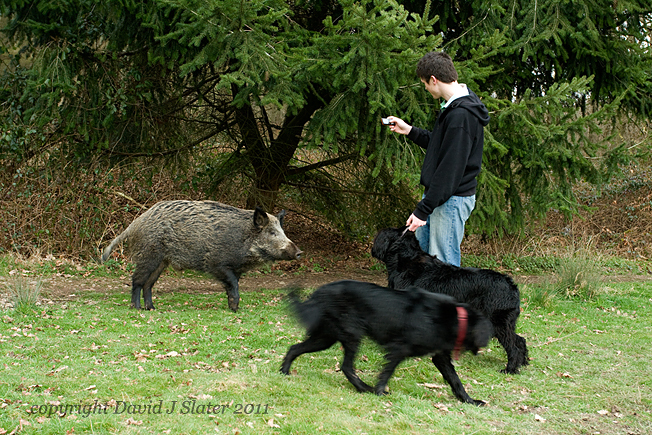 Have you seen firsthand what a wild boar can do to dogs and human beings? I have. Who is the moron that came up with the idea to put aggressive dogs in lead ? You want wild boars back? Wonderful! Just know that that will cause trouble. How common are wild boars in russia.They say that is the country that has the largest and most aggressive wild boars in the world.Can anyone comment on this? Boar is known for their wild attitude, but through the explanation to this blog I fully understand their behavior. Thank you for the great topic you shared, great job!. I understood that 'problematic' encounters between humans and 'wild' mamals usualy happen when the latter are not afraid. So eighter too young without their mum like probably these 5, or familiar with harmmless humans id est: domesticated/fed/big predators with previous experiance(cfr infra). When they are afraid, mammals usualy spot the humans before the humans spot them and the mammals walk away. It should be so for all mammals and even most other animals(incl snakes, but not crocodiles or alligators nor sharks). I even thought that all mammals had an instinctive fear for humans, that can be unlearned(cfr bigger predators that already fed on human flesh) rather than learned. In elephant attacs craving for alcohol(given by humans or naturally occuring in fruits) could be a factor.